D3 Store Planner is a highly detailed retail store outfitter. Select from dozens store fixtures commonly used in retail projects. Add details like shirts on racks or faceouts. Adjust number of shelves by easy parameter changes. Test a variety of layouts to maximize a store's potential. Export the number and type of fixtures accurately to spreadsheets or databases using the Calculate Quantities function in ArchiCAD. Displaying sales items on shelves and racks set the stage for capturing the feeling of shopping. 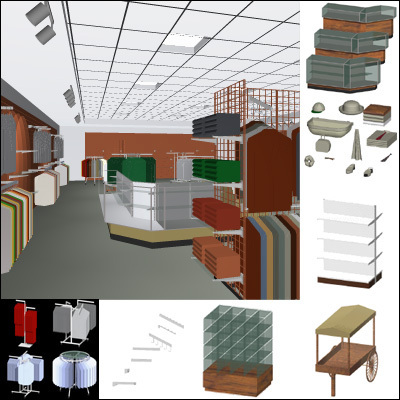 Get a better feel of the design and control over inventory by studying 3D store layouts. * NEW gondola display rack with adjustable shelves. * NEW clothes and accessories. * Fully operable racks with optional clothes display: four-way, two-way, super quad, straight and round racks. * Slatwall and Gridwall systems with Faceouts, Waterfalls, Hooks. * Display and cashwrap cabinets.